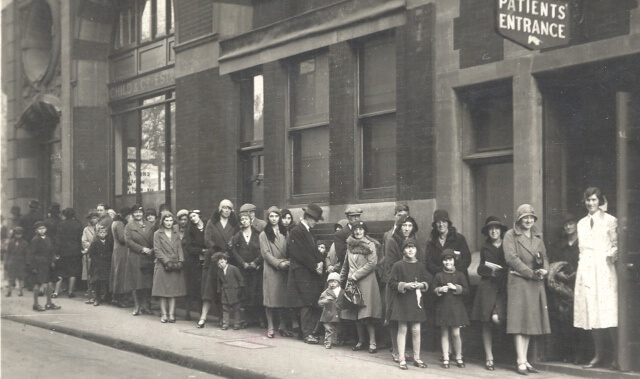 It is anticipated that 75 per cent, of Hornsey’s dentists will this week inform the Minister of Health that they are prepared to enter the new National Health Service, which comes into force on Monday next. But there appears to be no marked enthusiasm among Hornsey’s dentists, one way or the other.When a special meeting was held at the Hornsey Central Hospital on Monday only 11 dentists attended out of the 26 invited. There was some discussion, but the main speaker was Mr L. C. Atkins who is a member of the negotiating committee. Dentists are reluctant of expressing any opinions as to the possible immediate repercussions of the introduction of the new service.It is common knowledge that many people who would otherwise have been taking steps to secure new dentures have been delaying action until the new service is operative. Image with permission from the British Dental Association.